Over my many years of beer geekdom, I’ve witnessed a phenomenal shift in the type of beers which make beer nerds cream their pants. And the beers that homebrewers will argue endlessly over the correct recipe so they can brew it themselves. When I first got into good beer, it was all about IPA’s. Bell’s Two Hearted was a mythic beer, not yet available in any state bordering Pennsylvania. Pliny the Elder was just catching on, and nowhere near it’s current love-fest. Hell, a couple of friends and I split a half-barrel of Pliny and hand bottled it using a beer gun. All it took was a drive to a beer distributor. Can you imagine those “good ole days” I like to talk about so much? Bourbon County Stout, the original barrel aged craft beer (seriously, look it up!) is a different story with me. Even with their sale to the mortal enemy of craft beer, Anheiser-Busch Inbev, Goose Island will always hold a place in my heart. It was their Honkers Ale and Oatmeal Stout that cemented my love of good beer. My first taste of Bourbon County was in 2006, at their Clyborn brewpub in Chicago. I was beyond amazed, and had to take some home with me. With help of the bar staff, I picked up some bottles at a local liquor store. Believe it or not, Bourbon County Stout was only 9%ABV then. Brewing big beers is tricky business. These brews are going to require a true double fermentation. We are going to ferment them in our primary as normal, but then move them into a carboy and pitch champagne yeast, which is going to finish out our fermentation. Even more so than usual, it is very important that you get a lot of oxygen into your primary fermenter before you pitch the yeast. If you already use an oxygen tank and stone, great. If you simply shake your fermenter, eat a Cliff bar and shake it 2-3 times more than usual. And this beer shouldn’t just be left for two weeks and then transferred. Keep a close eye on your airlock. In a perfect world, the fermentation is going to stop when the alcohol gets high enough to where your ale yeast just stops working. But considering the strength of this beer, and the already harsh environment you are subjecting the yeast to, fermentation could stop prematurely. When you notice your airlock slowing down, start taking gravity readings. When you see the gravity is no longer going down, transfer it into a carboy and add the champagne yeast. This is an expensive beer, stay on top of your fermentation! With the exception of Dark Lord, these beers are barrel aged. But worry not, you don’t need to procure your own bourbon barrel. Some simple Googling (of the internet, not yourself) can tell you the types of barrels the brewery uses. Then all you need to do is go out and buy some of that spirit, and soak some toasted oak cubes in it. Voila! These big beers also tend to be big fermenters. A blow-off tube is always recommended! The recipe below has been provided with the help of a few homebrewers and my relentless pestering of the breweries and their brewers. This beer as changed in strength over the years, but the basic flavor profile as not. We’re going to shoot in the middle for a beer of about 12-13%ABV. This beer is going to require more room in the mash tun than usual. So if you have anything less than a 10 gallon tun, you might want to consider cutting some of the 2-row back and subbing malt extract. Just in case, the all-grain recipe has been formulated for a drop in efficiency. For the extract brewers, we’re not going to add all of the extract on brew day. Make sure you read all of the instructions before you brew. Just like at Goose Island, this beer requires a different approach than most beers. This beer is going to need to ferment in a bucket. If you normally use carboys, pick up a bucket from your homebrew store. Add two cans of the Light LME, and the can of Munich LME on brew day, just as if you were brewing any other beer. On day 5-7 of fermentation (it doesn’t matter the specific day, just pick one), remove the labels from the cans of extract and soak in hot water. Then sanitize a can opener and the outside of the cans, open, and add to the primary fermenter. DO NOT STIR. The act of fermentation will mix the extract properly. Trust me. 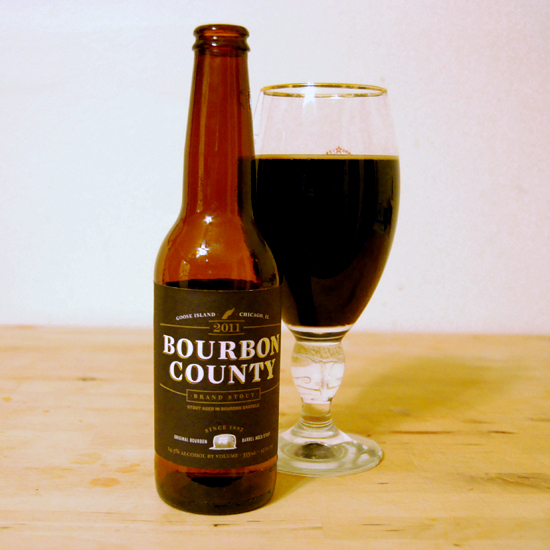 Bourbon County is aged in Heaven Hill barrels, so go get a nice bottle of that. Place the oak cubes in a shallow Tupperware-like dish, then cover with bourbon (they will float, that is ok). Put on the lid and let sit for at least 7 days, up to 14 days. You will add the cubes, and just the cubes (no extra spirit) to the carboy along with your champagne yeast. Let sit for 4 weeks, then move into a fresh carboy. I would then let the beer sit for at least an additional 6 months. Then add some more champagne yeast, and bottle as usual. If kegging, you do not need to add any additional yeast.